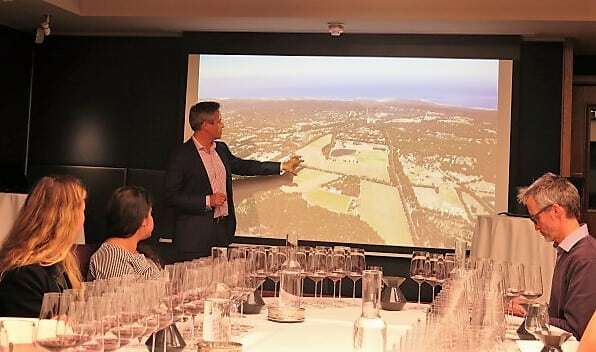 Cape Mentelle’s Estate Director Cameron Murphy was in town last month and took the opportunity to present a vertical tasting of Cape Mentelle Cabernet Sauvignon – the Margaret River estate’s flagship red. It was the perfect entrée for Margaret River Gourmet Escape and Cape Mentelle’s International Cabernet Sauvignon tasting, which I’m very much looking forward to next month. I’ve had the pleasure to taste Margaret River Cabernet verticals from the 80s through to the present with Cullen (1981-2010) and Vasse Felix (1985-2013), so it was interesting to compare the evolution of these pioneering Margaret River estates. There has been a significant refinement of style and terroir expression over four decades. Cape Mentelle’s estate vineyard was first planted in 1970 and 1973 on a ridge of free draining lateritic gravel on an east west row orientation to minimise the impact of strong Westerly sea breezes from the Indian Ocean only 5 km away. Early eighties wines have impressed with their staying power. However, the most exciting wines are more recent vintages, which show greater consistency and terroir transparency in line with changes in weather patterns (drier, warmer) and in viticulture and viniculture (see below). These days, elegance and refinement are the watchwords and attained without compromising ageability. Au contraire, as Rob Mann’s 30+ year drinking windows suggest, wines from the last decade have the balance for the long haul, without being impenetrable in their youth. Still, when 95% of Australians drink wine purchases within 48 hours, Murphy told us steps have been taken to enhance approachability since 2015. The Cabernet has been picked 3-4 days later and macerated longer (up to 70 days, I notice, in 2015) for a little more fruit expression, then aged with a bit more oak (the 2015 saw 55% new oak). 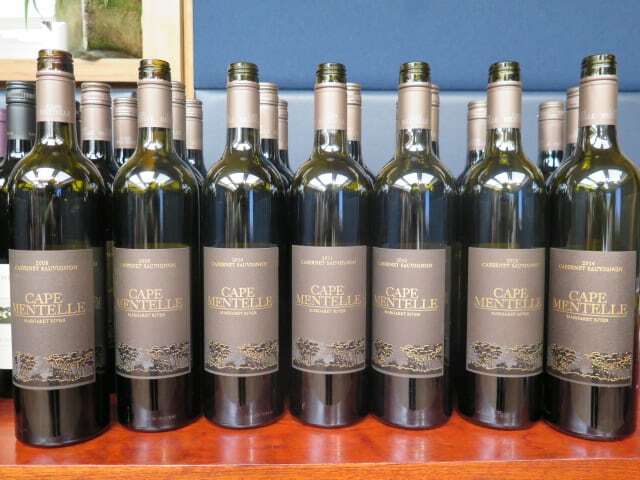 And because the wines show better younger under cork, Cape Mentelle Cabernet Sauvignon is now bottled 50:50 under screwcap and cork. The wines shown were the work of four winemakers. David Hohnen, co-founder, oversaw winemaking from 1970 to 2003. His Assistant Winemaker, John Durham (who started in July 1984) took over, until 2006. Rob Mann (who started at Cape Mentelle in December 2005) assumed the role of Chief Winemaker from 2007 until 2015. He was joined by Frederique Perrin in September 2014, who has overseen winemaking with effect from the 2015 vintage. Key viticultural/vinicultural changes over this period include incorporating a splash of (mostly) Merlot and Cabernet Franc (until 1999, the wine was 100% Cabernet Sauvignon). Petit Verdot and Malbec have also been planted this century. Whilst Margaret River’s original Houghton Cabernet clones would be the basis of the wines shown, new Bordeaux clones have been planted. New plantings have been re-oriented N/W (as opposed to N/S) and planting densities increased (to 4,200 vines/ha from 1,400-2,500 vines/ha). More refined tannins reflect more berry sorting and, in particular, from 2010, Margaret River’s first optical sorter. During the 90s, wines were more extracted, with more pump overs and longer time on skins (28-40 days versus 30 days latterly). Rob Mann endeavoured to keep the wines under 14% alcohol through earlier picking. Below you’ll find my tasting notes, together with vintage and winemaking details where provided. My picks? The 1983 (so robust), 1996 (just drinking so well now), 2008 to 2014 were all very strong, but I’d single out 2012 and 2014 for special attention. Vintage notes: The summer of 1983 in Australia is still well remembered, it produced drought in most regions and was widely considered ‘a hot one’. In Margaret River the cabernet ripened two weeks earlier than normal but the cool sea breezes enjoyed by the region ensured that the fruit was not over ripened and we fared much better than most other regions. Winemaking notes: grapes were crushed to 10,000 litre static fermenters. During the vigorous phase of fermentation the juice was pumped over the skins daily. After 7 to 10 days in the fermenter the skins were pressed and the new wine was stored in large oak vats for malolactic fermentation. 20 months in French oak barrels followed, one third of the barrels were new with the remainder 2 to 3 years old. The wine was course filtered and bottled in 1985 and originally released over 20 years ago in 1986. Made by David Hohnen. A wide bricky rim and reticent nose. In the mouth, it shows looser-knit, lighter plum, with red cherry, a hint of eucalyptus and bitter chocolate. Good freshness still, but the tannins are just starting to pucker, albeit, they help snag a bit more flavour on the finish. Going back, I found the oak quite nutty – a little plum and almond fragipane tart. I was surprised to learn that this was also a big wine on release. It seems underwhelming after the 1983 though, to be fair, it still has life to it. 13% Made by David Hohnen/John Durham. This is the vintage which disappeared from everyone’s glasses. In appearance, it has a deep core despite its bricky rim. Gutsier than the 1990 and closer to the 1983, similarly with good energy, but the ’96 has a touch more refinement. Murphy mentioned something I recall David Hohnen telling me during a visit about the very positive impact of bird nets during the 90s. Not having to rely on well-timed marri blossom to keep the silver eyes (birds) at bay resulted in more consistency. Cape Mentelle Cabernet Sauvignon 1996 is initially very minty on nose and palate with ripe plum, cassis, warm brick and a hint of kelp. Going back, I found it inkier and more intense, the kelp ratcheted up, but also the fruit. It had lovely persistence and parry – delightful resonance – to its perfumed cassis and dried herbs. Rounded, with a mellow bricky balanced finish. A very complete, mature wine. I checked out a second bottle, also in great form. 14% Made by David Hohnen/John Durham. A much deeper hue than the ’96, with a narrower bricky rim. Seems richer and riper on nose and palate, with panforte dried fruits and more evident oak. Quite mellow initially, with some savoury porcini/bouillon and tomato plant notes. A hint of ketchup (sweet and sour) too. Made in the bigger is better era, with riper fruit and more oak, it is grippier, but ultimately teeters over the edge. Going back, it is sweet, vegetal, toasty, quite pungent. Not holding. 14% Made by David Hohnen/John Durham. A deeper hue again, opaque, with a narrow brick rim. Quite punchy tannin and acid on the attack. Yes, firm tannins, spicy but also quite chewy going through, finishing a little coarse and dry. That riper profile in evidence, with Christmas cake. Going back, the fruit – attractive blackcurrant – has caught up, fleshing out and smoothening the palate, though there remains a dryness/dustiness to the finish. 14.5% Made by David Hohnen/John Durham. Vintage: 2007 was one of the earliest recorded vintages in Margaret River. The season was marked by a warm, dry growing season and modest yields. Conditions such as this produce amongst the best examples of cabernet and cabernet merlot blends, much like the exceptional 1999 vintage in their opulence, varietal typicity and concentration. Winemaking: After hand harvesting and sorting, destemming and light crushing, individual vineyard batches were fermented on skins for 25-30 days. At the desired balance of fruit and tannin extraction, each batch was gently basket pressed, with harder pressings kept aside. The individual parcels were racked to oak following pressing for malolactic fermentation. Regular rackings over an 18 month period ensured the individual wines were at their best prior to blending. The wines were matured in selected Bordeaux coopered barriques of which 40% were new with the balance being one year old. The final blend was completed in November 2008 and the wine was bottled the following month. Made by Rob Mann. Tasting note: Nice uniformity of (deep crimson) hue. The oak, vanilla with a touch kid glove/cured meat, puts me in mind of Rioja?!? Concentrated fruit here – deep seated cassis, still tightly clasped, which means the oak seems pronounced, quite elbowy. Shows riper vine fruits and black olive as it opens up, with a touch of sinew to the tannins. Still, I found the oak intrusive/distracting. Perhaps it needs time, but I’d like to see better balance at this stage. 100% Cabernet Sauvignon. 14% Sealed under screwcap. Vintage: a wet winter and warm spring encouraged uniform growth in all varieties. An ideal flowering period marked the beginning of a long dry spell lasting until mid-February. The harvest for red varietals was ideal with finished wines defined by excellent tannin structure and length. The vintage is sure to be amongst the greatest vintages for red wines in Margaret River. Winemaking: The hand-picked fruit was destemmed and berry sorted followed by light crushing. Individual vineyard batches were fermented on skins for up to 40 days. At the desired balance of fruit and tannin extraction, each batch was gently basket pressed, with harder pressings kept aside. Following pressings individual parcels were racked to oak for malolactic fermentation. Regular rackings over an 18 month period ensured the individual wines are at their best prior to blending. The wines were matured in selected Bordeaux coopered barriques of which 40% were new with the balance being one year old. The final blend was completed in November 2009 and bottled in February 2010. Tasting note: coolly elegant, the 2008 is not as concentrated as 2007. Its powdery, cedary oak is better integrated, the fruit bright and juicy and tannins fine grained. Shows fresh blackcurrant, blackberry and sweet plum. Southern Margs restraint and persistence. Very even going back; lovely poise and balance. 96% Cabernet Sauvignon, 4% Merlot. 13.5% Made by Rob Mann. The vintage: A cool, wet and windy spring extended into the flowering period around November, setting up the season for low yields for all varieties. The sun came out on cue in December and perfect ripening conditions continued through harvest, interrupted only by a spot of rain at the start of March – enough to give the vines a drink and see all varieties harvested in optimal condition. Tasting note: Bright crimson, no rim as such. Young. Nose and medium-bodied palate show classical restraint – dry and firm with nice intensity of blackcurrant, sweeter plum and hints of earth and bitter chocolate. Fresh acidity and fine, powdery tannins make for good persistence. Elegant, very poised with time on its side. Composed of 97% Cabernet Sauvignon, 3% Merlot. 13.5% Made by Rob Mann. Vintage: the 2010 harvest in Margaret River continues a run of excellent vintages again marked by a very dry and mild summer with below average rainfall and cooler than average night time temperaturs. The only significant rainfall for the vintage period was not until midApril after all the fruit had been harvested ensuring an excellent ripening period with fruit retaining pristine varietal flavours with great concentration and intensity. Winemaking: The hand-picked fruit underwent destemming and berry sorting followed by light crushing. Individual vineyard batches were fermented on skins for up to 30 days. At the desired balance of fruit and tannin extraction, each batch was gently basket pressed, with harder pressings kept aside. The individual parcels were racked to oak following pressing for malolactic fermentation. Regular rackings over an 18 month period ensured the individual wines are at their best prior to blending. The wines were matured in selected Bordeaux coopered barriques of which 40% were new with the balance being one year old. The final blend was completed in October 2011 and bottled in December 2011. Analysis: 13.5% alcohol, 6.3 g/l acidity, 3.6 pH. Tasting note: A deeper hue than the 2009 and, while still medium bodied and elegant, it is more concentrated in the mouth, with firmer tannins. Reveals blackcurrant, blackberry and plum with earth nuances on entry. Opening up, savoury iodine/kelp, meat pan juices follow as the fruit, tightly wound, continues to build. I sense this wine will go some distance. 96% Cabernet Sauvignon, 4% Merlot. 13.5% Made by Rob Mann. £47.50 at The Champagne Company. Vintage: The 2011 harvest in Margaret River was warm, dry, and early and continued the excellent run of recent vintages. Warm nights and above average daily temperatures throughout the growing season led to very early ripening across all varieties with harvest commencing earlier than any of the last five vintages. Ripe, plush and velvety tannins with abundant fruit flavour are the result of an outstanding early and warm vintage. Winemaking: The hand-picked fruit underwent destemming and berry sorting followed by light crushing. Individual vineyard batches were fermented on skins for up to 30 days. At the desired balance of fruit and tannin extraction, each batch was gently basket pressed, with harder pressings kept aside. The individual parcels were racked to oak following pressing for malolactic fermentation. Regular rackings over an 18 month period ensured the individual wines are at their best prior to blending. The wines were matured in selected Bordeaux coopered barriques of which 50% were new with the balance being one year old. The final blend was completed in November 2012 and bottled in December 2012. Analysis: 13.5% alcohol, 6.3 g/l acidity, 3.59 pH. Vintage: The 2012 vintage was noted by above average summer temperatures and average rainfall. What resulted was a steady ripening period leading up to a hot January and an early start to the harvest. Mild temperatures throughout February and March ensured fruit harvested in perfect condition and completed by early April prior to heavy late April rains. Winemaking: the hand-picked fruit underwent destemming and berry sorting followed by light crushing. Individual vineyard batches were fermented on skins for up to 30 days. At the desired balance of fruit and tannin extraction, each batch was gently basket pressed, with harder pressings kept aside. The individual parcels were racked to oak following pressing for malolactic fermentation. Regular rackings over an 18 month period ensured the individual wines are at their best prior to blending. The wines were matured in selected Bordeaux coopered barriques of which 50% were new with the balance being one year old. The final blend was completed in October 2013 and bottled in November 2013. Anaylsis: 13.5% alcohol, 6.0 g/l acidity, 3.6 pH. Tasting note: This vintage has produced charismatic Cabernets and Cape Mentelle 2012 is no exception. It has that elegant, southern frame, but seems longer and stronger, with great concentration and animation both to the fruit and classy oak in support – as if rising to the occasion. It shows perfumed fresh blackcurrant, with a touch of blueberry and juicy blood plum. A ring of violets and dried herbs lends lift and resonance. This vintage seems especially mineral, its fresh, insinuating acidity sluiced with iodine/kelp and gravel notes. Duracell-like, terrific length – on and on – to the focused, firmly under-pinned finish. 91% Cabernet Sauvignon, 8% Merlot, 1% Cabernet Franc. 14% Made by Rob Mann. Currently rather nicely price at Hailsham Cellars, down from £59 to £43. £65 at Clos19, which is the RRP quoted at the tasting. Vintage: The lead up to harvest experienced a wild, cool and windy November which interrupted flowering and fruit set and ultimately resulted in the lowest yields for a decade. The summer leading into the 2013 vintage recorded temperatures well above average with perfect ripening conditions with white fruit harvested quickly and early in February and red fruit benefiting from a cool and mild March allowing extended ripening and full tannin maturity. Another great vintage for Margaret River. Winemaking: The hand picked fruit underwent destemming and berry sorting followed by light crushing. Individual vineyard batches were fermented on skins for up to 30 days. At the desired balance of fruit and tannin extraction, each batch was gently basket pressed, with harder pressings kept aside. The individual parcels were racked to oak following pressing for malolactic fermentation. Regular rackings over an 18-month period ensured the individual wines are at their best prior to blending. The wines were matured in selected Bordeaux coopered barriques of which 50% were new with the balance being one year old. The final blend bottled in October 2014. Analysis: 13.5% alcohol, 6.0 g/l acidity, 3.58 pH. Tasting note: youthful and restrained. Lighter than the 2012. Shows blackberry and currant, juicy sweet plum, with violets and, with time in glass, cinnamon, dried herbs and pungent kelp. Finishes mineral, with graphite tannins. Elegant, unshowy. 91% Cabernet Sauvignon, 8% Cabernet Franc, 1% Merlot. 13.5% Made by Rob Mann. Vintage: Margaret River experienced one of the warmest vintages on record on a par with the very warm 2011 vintage. The red varieties enjoyed a long warm ripening season that ensured beautiful mature tannins and bright varietal fruit flavours. Tasting note: a significantly deeper hue than the 2013, the nose and palate youthfully intense with powdery fresh blackcurrant, sweeter, juicy blood plum and a very subtle edge of green/eucalyptus on the attack. Initially powdery tannins, almost talcy and finely mouthcoating, build in the mouth, finishing firmer – a plume of mineral, iron filing tannins, still harmonious with the inky, perfumed fruit. Finishes long, drawn out, shaped by that plume of tannins and feathered with dried herbs and roses. Power and intensity delivered with cool precision. Bristling with energy, yet elegant. Terrific. 85% Cabernet Sauvignon, 15 % Merlot 14% Made by Rob Mann, Frederique Perrin.